Intersolar 2007 and 2006 California Clean Tech Open (CCTO) companies have dominated Blog coverage over the past month. It’s time to get back to covering staple companies and topics although there are follow up Intersolar 2007 and PV Industry Forum 2007 posts plus SEMICON West coverage in the works. Applied Materials Names Chris Eberspacher to Lead Advanced Solar Research and Development lends support to the notion that things may not be so rosy at Nanosolar. Dr. Eberspacher left Nanosolar just over one month ago. Alan Swanson Joins Blue Square Energy as Vice President of Manufacturing Operations bringing thirty years of experience from Tyco Electronics and the former AMP, Inc. To complete the management team in preparation for a potential IPO, BSE needs to name a VP of Engineering or CTO or both. Following the Moser Baer model, CMC Magnetics, the largest Taiwanese maker of optical media, is setting up a subsidiary, Sun Well Technology, to produce thin film solar modules in Taiwan. Information from industry sources (rumors) allege the 100MWp facility will be equipped by Oerlikon Solar. I stumbled on this video animation titled Inflatable Solar Collectors on YouTube. I don’t know the origin of the animation, but this appears genuine. Norsk Hydro ASA (NYSE:NHY) and the Umicore Group (EBR:UMI) have formed the HyCore joint venture to produce solar grade silicon from metallurgical silicon using a process first researched by Umicore. €26 million will be invested to construct a 20 metric ton pilot plant at Herøya, in Porsgrunn, Norway, by 2008. If proven successful, a larger facility will be constructed at the same site to produce industrial scale volumes by 2010. Umicore has about 90% market share in Germanium (Ge) substrate wafers required for compound semiconductors like III-V Triple Junction solar cells used in High Concentration Photovoltaic systems. Updated CORE Queues every two weeks now? CORE Queue > 10kw July 13, 2007 (greater than 10kW), CORE Queue <= 10kw July 13, 2007 (less than or equal to 10kW), Public Non K-12 Schools CORE Queue July 13, 2007, and Public K-12 Schools CORE Queue July 13, 2007 are available. An Updated 2007 CORE Budget July 13, 2007 shows the under funded status details of the main CORE Queues, and the Comment Summary: New Jersey Renewable Energy Solar Market Transition Straw Proposal has a number of company and policy centric comments and counter proposals. A fresh new look for the NJCEP website is due by August 1, 2007. I heard Oerlikon Solar was briefing press (though not this blogger!) about a significant announcement. I have no idea what it is, but speculations include ersol or Schott in official production, more new orders like CMC Magnetics, or could Micromorph tools be shipping? Solar Newsletter No. 2, July 17, 2007, was distributed at SEMICON West but is not yet on the Oerlikon Solar website at post time. Per the EPIA (European Photovoltaic Industry Association) Newsletter, SOLARIS, the PV CYCLE association created on 5th July 2007 by founding members: Avancis, BSW, Conergy, EPIA, Isofotón, Schott Solar, SolarWorld, and Sulfurcell. An executive board was appointed to prepare for the first General Assembly meeting of the PV Cycle association scheduled for September 18, 2007, in Brussels, Belgium. Interested companies are welcome to apply for membership in the PV CYCLE association and membership information should be forthcoming to EPIA members. In Sol3g makes a 1 kWp pilot installation financed by Solúcar, an Abengoa subsidiary, the company announced an agreement with Solúcar Energia, S.A., for a 1kWp (kilowatt-peak) HCPV (High Concentration PhotoVoltaic) system pilot installation. Another 20kWp of HCPV modules (M40?) will be supplied for mounting on Solúcar’s own two-axis tracker. 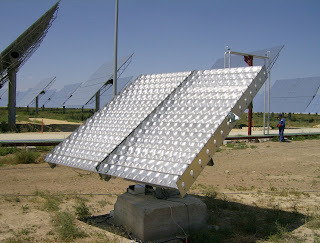 Both of these systems will be located in the Solar Platform of Sanlúcar la Mayor, Sevilla, Spain. And SunPower CEO Tom Werner Named Ernst & Young Entrepreneur of the Year 2007 Award Recipient in Northern California would not be my first choice since I believe the PowerLight acquisition is an expensive distraction from increasing SunPower’s production of the highest efficiency, back contact, monocrystalline solar cells and modules. Why was Ernst & Young LLP not disclosed as being the independent auditor of PowerLight Corporation’s financials from 2005 and 2006? Although the award claims to use a panel of independent judges, how were the initial nominations made? The SPR-315 datasheet is now online at the SunPower website. Given the accelerated velocity of photovoltaic and solar activity, I don’t envy publications trying to cover every aspect of the PV Industry. I’ll stick with this Blog’s established format of looking for areas less covered or where I can add insight and commentary. Using a novel technology that adds multiple innovations to a very high-performance crystalline silicon solar cell platform, a consortium led by the University of Delaware has achieved a record-breaking combined solar cell efficiency of 42.8 percent from sunlight at standard terrestrial conditions. It would be great if you could get some more info – my question is how the need for concentrators is done away with. They talk about a 20x concentration ratio . . . how? It’s unclear to me.